Ikra recently celebrated its first anniversary, bringing a combination of traditional Russian dishes and Mediterranean cuisine with Catalan roots to the Eixample neighborhood of Barcelona. Designed by La Petita Dimensió, the decor of the restaurant is flexible in creating a warm and lively atmosphere for lunch, dinner, drinks and live music. Chef Gerard Barberan uses carefully chosen light and fresh seasonal ingredients that make you feel as if you are eating at home. Below you can see some of the classic Russian dishes offered at Ikra. Borscht is a soup of Ukrainian origin that is popular in many Eastern and Central European countries, made with beetroot as the main ingredient. Served with jamon, garlic and rye bread, the borscht at Ikra makes a soothing winter comfort. Pod Shuboy, meaning literally, ‘herring in an overcoat.’ This dish is made with beetroot, herring, carrots, egg, rice and a little mayonnaise. Raviolis Caseros also called Pelmeni are meat filled dumplings. Ensaladilla, ‘Rusa-Rusa’. The ingredients used are carrot, rice, potato, peas, egg, mayonnaise and cow’s tongue. 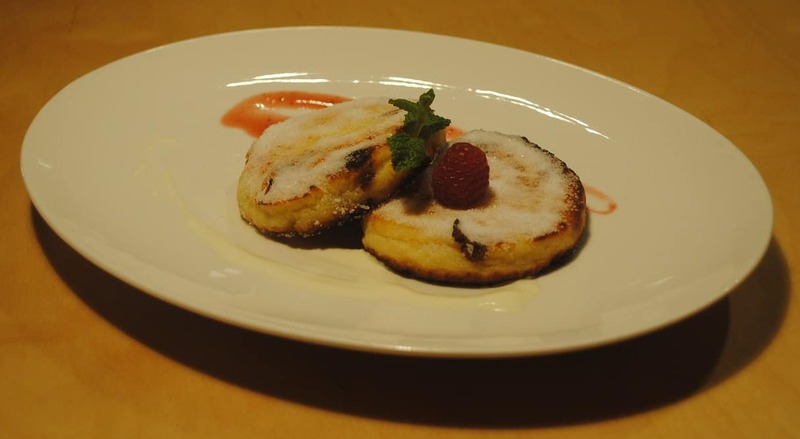 Syrniki are fried cottage cheese pancakes, garnished with raspberry. These pancakes make a healthy and delicious desert.